A major cloud-based applications company’s “What Is” pages drove over 78,000 organic visits and 24,000 organic conversions since their creation in February 2015. Host Analytics’ “What is EPM” page is now being featured in the Answer Box. Snowflake’s glossary pages helped several keywords ranking on page 1, despite not ranking at all pre-creation in May 2017. Answer Boxes have become more and more prominent since their launch in 2013. At first Answer Boxes were mostly triggered by landmarks, sports or dates queries but now most questions queries will return an Answer Box. 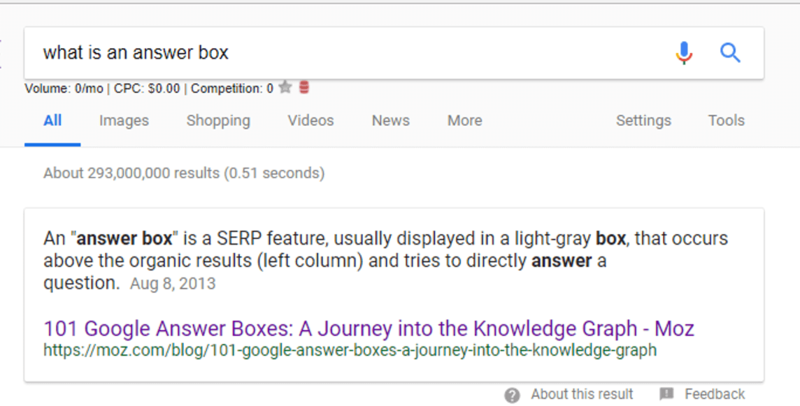 As a consequence, most Answer Boxes are already claimed and Obility needed to not only identify natural language questions queries with enough search volume and relevancy to justify the creation of new pages, but also identify queries with no Answer Box or Answer Boxes that could be taken over. Obility’s process varied based on the needs of each client. 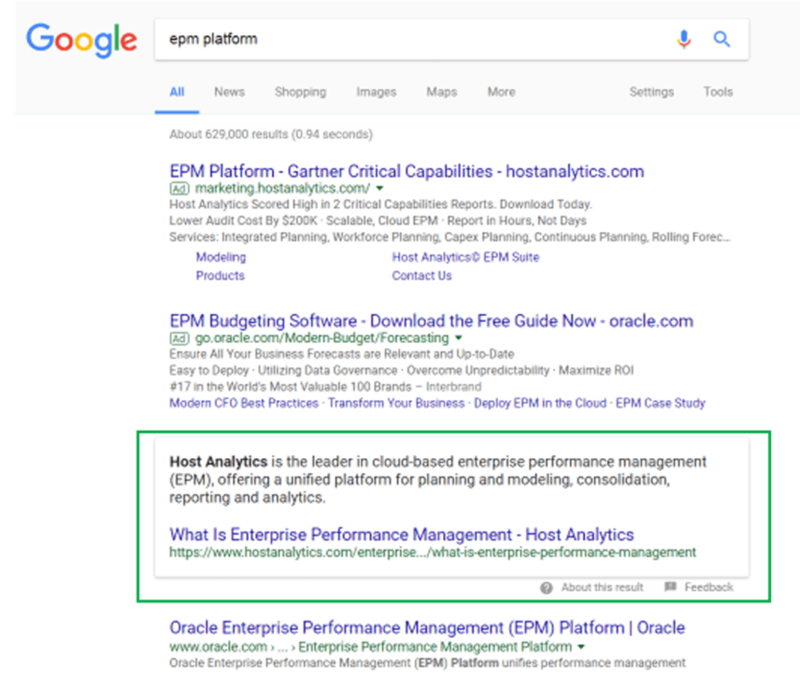 Host Analytics already had a glossary page for EPM (Enterprise Performance Management) but the page was not compliant with SEO best practices and was not performing well, it wasn’t ranking for “What is EPM” at all. “What is EPM” and other variations of “EPM” and “Enterprise Performance Management” keywords are a very high priority for Host Analytics, so Obility completed keyword research to identify the best variation of that keyword and provided recommendations to optimize the H1, the meta title, the meta description and the on-page content. The cloud-based applications company and Snowflake did not have glossary pages or FAQ sections. Because both clients were looking to increase their organic traffic and rankings Obility suggested targeting definition-type keywords. Obility started by doing keyword research to identify a list of keywords appropriate for glossary pages. Once the keywords were approved by the clients Obility provided content creation recommendations that followed best practices for the Answer Box: using the keyword in the H1, answering the question directly in the first sentence and being accurate and concise. Once the page was created, Obility reviewed and provided final recommendations. Tracking the progress in organic traffic, conversions and keyword rankings on a monthly basis helped Obility assess the success of the new and optimized pages. The optimization made to the existing “What is EPM” page helped Host Analytics be featured in the Answer Box for that query, despite Oracle and Wikipedia also ranking on page 1. Pre-optimization Host Analytics was not ranking in the first 50 results for this query. Being featured in the Answer Box helped increase the organic traffic to “What is EPM” page by 105% since the recommendations were implemented on 10.30.2017. Between their creation in May 2017 and February 2018, the new glossary pages received 796 organic visits and 18 organic conversions. Snowflake is now ranking in first position for “automatic encryption” and “what is automatic encryption” and in third position for “data warehouse glossary”, despite not ranking in the first five pages of the Search Engine Page Results in May 2017. The latest glossary page, “What is a Data Vault” was created in October 2017 and has already helped move the ranking for that keyword to the bottom of page 1. Organic traffic to Snowflake’s glossary pages between 05.01.2017 and 02.28.2018. The FAQ pages were created in March 2015 and have been performing very well since their creation. The website received over 20,000 clicks in November 2017 and 16% of them on the FAQ pages. Between February 2015 and February 2018 the FAQ pages drove over 85,000 organic visits (3.13% of the total organic traffic) and 24,000 conversions (2.47% of total organic conversions). In total the 12 glossary pages are ranking for 369 keywords. After a significant growth of 133% organic YoY between 2016 – 2017 and 2015 – 2016, our client continued to sustain a traffic increase of 6% between 2016 – 2017 and 2017 – 2018. Organic traffic to What Is pages between 02.01.2015 and 02.28.2018. This case study was carried out by Joyce, who has been working in SEO since 2012 and Obility since 2015. As a Senior SEO Manager, she helps her clients identify their SEO needs and develop effective SEO strategies to increase their organic traffic and conversions and improve their user experience. Joyce is also a member of Obility's Culture Club, where we promote and encourage Obility's values and celebrate our successes. Originally from France, she's been living in the US since 2011. In her free time, she enjoys reading, cooking and going on hikes with her husband.